Bank Pocztowy (Bank) is a versatile entity providing safe and transparent financial services through the network of Poczta Polska, its own outlets countrywide and through remote contact channels. The mission of the Bank, the parent of the Bank Pocztowy Capital Group (Bank Pocztowy Group, Group) is defined as “simple and @ccessible banking”. For clients, this means easily understandable financial products and services adjusted to their needs, friendly environment, clear procedures and transparent communication. Bank Pocztowy focuses on consumer banking and provides a supplementary offer for microenterprises. At the same time, the Bank pays special attention to the educational aspect of its operations. We have carried out a broad campaign aimed at improving clients' understanding of finance and use of remote access channels to the Bank. Poczta Polska S.A. is the key shareholder and business partner of Bank Pocztowy holding 75%, i.e. 10 shares in its share capital. Powszechna Kasa Oszczędności Bank Polski S.A. also holds shares in the bank (25% - +10 shares). Thanks to the strategic alliance with Poczta Polska, the Bank’s services and products are available in ca. 7.3 thousand sales points (post offices, branches and agencies) countrywide. Apart from Poczta Polska, Bank Pocztowy offers its services and products through 293 own outlets, electronic distribution channels (online and telephone banking) and a network of mobile agents of its subsidiary – Spółka Dystrybucyjna Banku Pocztowego Sp. z o.o. Additionally, the Bank’s products are distributed by 23 thousand postmen and other agents. The wide distribution network constitutes a unique competitive advantage of the Bank. At the end of 2014 the Bank provided services to 1,432.3 thousand consumers including microenterprises. In 2014 it acquired 218.7 thousand new clients in this group, contributing to the process of preventing financial exclusion, which is a socially adverse phenomenon observed in Poland. Consumers with stable income and low insolvency risk constitute a substantial portion of Bank’s clients. The client group includes elderly people, who accounted for 34.1% of all retail clients of the Bank at the end of 2014. We served over 15.4 thousand of entities in the institutional banking client group. In 2014, the Group generated a net profit which was 21.1% higher than in the prior year, thus improving ROE by 0.9 p.p. to the level of 10.5%. As at 31 December 2014, the balance sheet total of the Group amounted to PLN 7,719.0 million and represented 0.5% of the total assets of the Polish banking sector1. Gross loans and advances to customers reached PLN 5,325.7 million. Liabilities to Group’s clients amounted to PLN 6,492.0 million, including over 71.6% of funds obtained from the consumer sector. 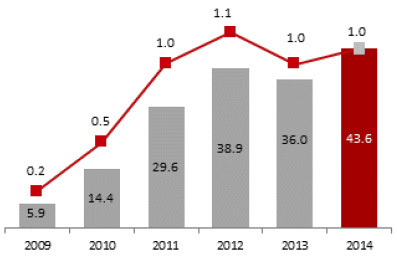 Following its dynamic growth reported in recent years, Bank Pocztowy, the parent in the Capital Group, managed to gain an important position in selected segments of the Polish banking sector. With the share of 2.8%, the Bank has gained an important position on the current account market2. 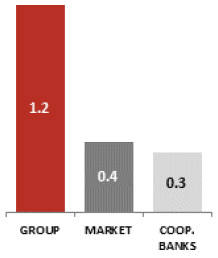 In 2014, the Bank managed accounts for 6% of elderly Poles3, considering a low demand for banking services in this customer group. During 2014, the Group maintained its liquidity ratios on safe levels, and its capitals were adequate to the scale of operations. 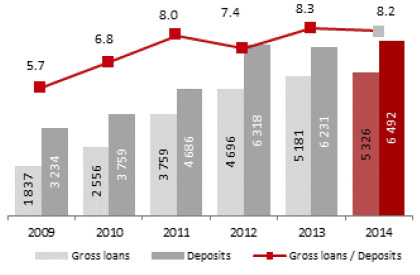 At the end of the year the relation of loans and advances to deposits stood at 82.0%. 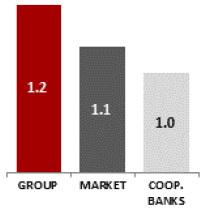 In December 2014 the solvency ratio for the Group amounted to 13.4%, and Tier 1 reached 10.1% (improvement by 0.4 p.p.). 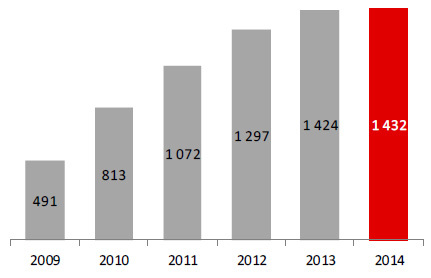 At the end of 2014 employment in the Group reached 1,633 FTEs. Bank Pocztowy’s bonds have been listed with Catalyst. Bank’s position as a responsible issuer caring for high standards of communication with capital market has been proven with the first award in The Best Annual Report contest for 2013 in the category Banks and Financial Institutions. Spółka Dystrybucyjna Banku Pocztowego Sp. z o.o., whose key objective is to support distribution channels of Bank Pocztowy and access prospect clients from remote locations. Centrum Operacyjne Sp. z o.o. (Centrum Operacyjne), providing professional services in process administration for products and services for entities in the financial sector. Bank Pocztowy started operations in 1990. 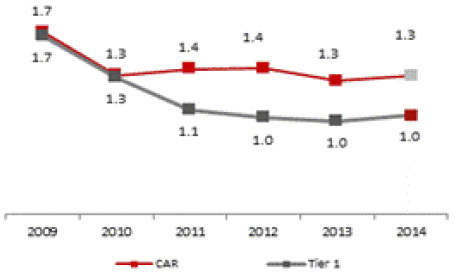 Reactivation of postal banking in Poland was the idea underlying its establishment. To this aim and in order to develop Bank Pocztowy S.A. the GIRO non-cash settlement system was launched to enable fast and easy processing of bulk payments, reduce costs of issuing and circulating cash in the economy and to provide bank services to clients, in particular consumers, through a wide distribution network of Poczta Polska. Therefore, initially the Bank was a typical settlement institution with performance highly related to the volume of settlements with Poczta Polska. In 1998, transformation into a consumer bank was initiated. The Bank started to reach an increasingly large group of clients through a sales network of Poczta Polska and own branches and sales points. At the same time, it started to launch new products. In 1999 all post offices provided comprehensive services related to GIRO personal accounts and, additionally, Visa Electron cards to the accounts were offered. In 2003, the Bank launched an online information system. Two years later, in 2005, GIRO personal accounts were renamed to Pocztowe Konto Nestor for elderly people and Pocztowe Konto Standard. Agreement concluded by Bank Pocztowy and Poczta Polska in 2006 regulating the terms of cooperation between the institutions in consumer banking services was a breakthrough event for the Bank's consumer business. Under the agreement over 2 thousand Postal Financial Points were opened in post offices by the end of 2009 to streamline service provision to the Bank’s customers by post office staff. Following the gradual changes and development of the sales network, in February 2010 the number of clients exceeded 500 thousand, in October 2011 it was 1 million, and now it its approaching 1.5 million. Along with the growth in the number of clients, the Bank has consistently improved its profitability, as indicated by a regular increase of its financial profit and ROE. In 2010 the Bank’s subsidiaries: Spółka Dystrybucyjna Banku Pocztowego Sp. z o.o. and Centrum Operacyjne Sp. z o.o. were established and commenced business activities. As a result ,the Bank Pocztowy Capital Group was set up. 1. Net loans and advances. realized gain/loss on other financial instruments. 3. Income increased by gain/loss on other revenue and operating expenses. the above regulations, the Bank has been released from the obligation to determine its consolidated capital requirements. Separate data. risk types (with subsequent amendments). Separate data. 5. NPL – the share of impaired loans and advances in the gross credit portfolio. 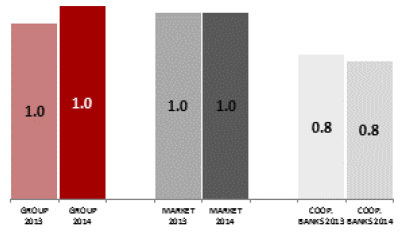 In 2014, operations of the Bank Pocztowy Group focused on development of the retail banking. The growth ratios in retail loans5, consumer loans6 and retail deposits7 were higher than that of the entire banking sector, and amounted to 0.7 p.p., 7.8 p.p. and 1.3 p.p., respectively. 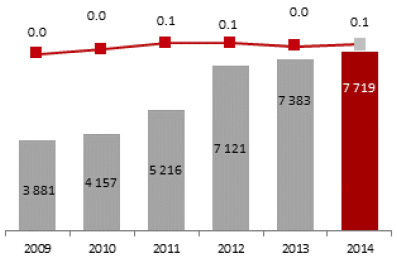 In 2014, following a growth in the share of highest profitability loans (i.e. consumer loans) in the entire loan portfolio, the Bank saw an increase in the interest margin whose level was substantially higher than the banking sector average. 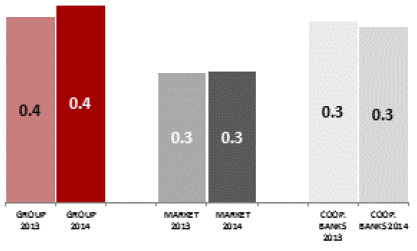 The margin of the Bank Pocztowy Group increased from 3.6% in 2013 to 3.8% in 2014 while in the entire banking sector it remained flat, and in the cooperative banking sector it dropped from 3.5% in 2013 to 3.4% in 2014. The substantial improvement in the Group’s financial performance translated to an increase in net ROE. 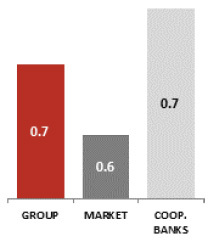 The banking sector saw a slight growth in ROE, while the cooperative banking sector saw it drop by 0.2 p.p. Interest margin, ROE for the banking and cooperative banking sector – the denominator includes the asset level with interest margin and capital level for ROE pertaining to two periods: at the end of the audited period and at the end of the prior year. 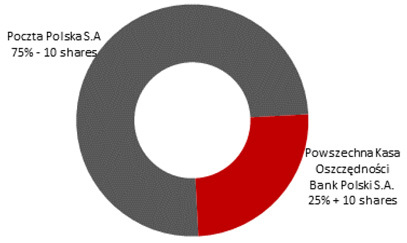 1 Source: PFSA Monthly data for the banking sector – December 2014. 4 Source: PFSA, Monthly data for the banking sector, December 2014. 5 Retail loans in the banking sector including foreign operations and cooperative banks – active – sheet Table 03, Gross receivables from non-financial sector, government agencies and self-government bodies. Receivables from households have been classified as retail loans in the banking and cooperative banking sector. 6 Consumer loans in the banking sector including foreign operations and cooperative banks – active – sheet Table 03, Gross receivables from non-financial sector, government agencies and self-government bodies. Consumer loans (private individuals) have been classified as retail loans in the banking and cooperative banking sector. 7 Retail deposits in the banking sector including foreign operations and cooperative banks – active – sheet Table 04, Deposits of non-financial sector, government agencies and self-government bodies. Household deposits have been classified as retail deposits in the banking and cooperative banking sector.